Herb Titus of our firm is quoted in this article in PoliZette/LifeZette concerning President Obama’s last-minute designation of vast new national monuments in Utah and Nevada. This article by Newsmax mentions our comments on the ABA effort to punish lawyers not sufficiently sensitive to homosexuals, transgenders, etc. World Net Daily’s Bob Unruh published a timely story exposing the true nature of the ABA proposed ethics change, published on the eve of the meeting of the ABA House of Delegates in San Francisco. The Daily Caller carried a story today about U.S. State Department request for extraordinary delays in making public disclosure of certain of Hillary Clinton’s emails, in a case brought by our firm for Citizens United. Forbes magazine carried an article by George Leef which mentions our recent American Thinker article on the Ninth Circuit’s Peruta decision. This article discusses when a candidate may use campaign funds for legal fees without violation of FEC “personal use” regulations. Article: How Much Power Do Juries Really Have? Herb Titus was quoted in this article about jury nullification. CNN’s article about the Second Amendment in Presidential politics discusses our work for Gun Owners of America. 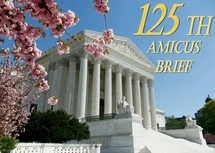 amicus brief in the Voisine case. An article in Slate.com covered the amicus brief we filed for Gun Owners of America in the Voisine case. This article discusses our brief in Zubik v. Burwell & Little Sisters of the Poor v. Burwell. This article discusses our brief in Sissel v. Department of Health and Human Services. National Review Online discusses Citizens United’s FOIA complaint that we filed against the State Department earlier today. In an article on Christmas Eve, Bob Unruh of World Net Daily covered our amicus brief for Gun Owners of America and others opposing the broad federal ban on most machine gun ownership. promoting the state’s abortion services. This discusses our brief for Gun Owners of America and The Heller Foundation supporting the right to own fully automatic weapons.